Is your business fit to dominate its industry? Enter your name and email and our team will reach out and send you a course syllabus. Understand how to get started scaling up your business with an industry-dominating strategy. Are you struggling alone to scale up your business? Imagine your entire team―from front line employees to senior executives―aligned and contributing to building an industry dominating company. 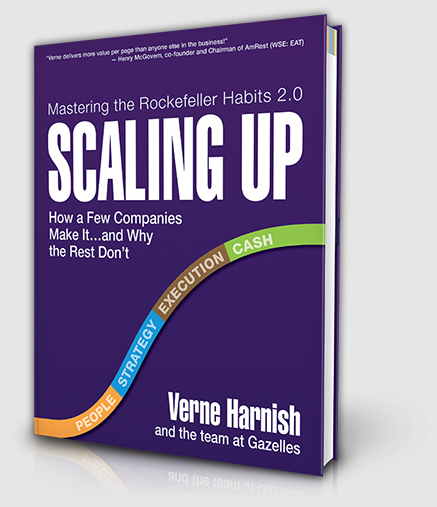 More than 40,000 business leaders have used Verne Harnish’s methodology to scale their companies successfully―many to $1 billion and beyond. Too many business owners feel they’re dragging the rest of their organization up the S-curve of growth. It doesn’t have to be that way. Running a business is ultimately about freedom. Scaling Up shows business leaders how to get their organizations moving in sync―while enjoying the ride. Faster results with less effort – Inspire your entire team to follow your rock-solid plan. Watch your company’s reputation (& revenue) soar as employees fulfill 100% of all promises – No excuses. Light past revenue records on fire and gear up for a legendary year of business growth.